The Escape Game is a leading operator of experiential escape games. 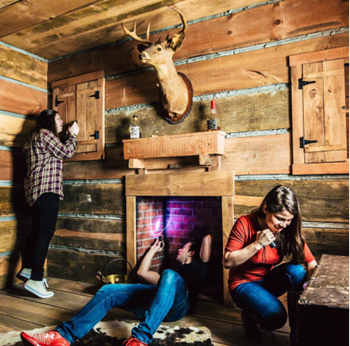 The Escape Game runs unique and interactive entertainment experiences that combine storytelling, puzzle-solving and teamwork in an immersive environment. The Escape Game creates interactive game experiences featuring elaborately designed multi-room sets with a guiding narrative to focus customers on a thrilling mission to escape, save or solve through progressive puzzles which require awareness, logic, physical tasks and teamwork. The company has guided hundreds of thousands of customers to date as protagonists through their own carefully-crafted adventure in storylines such as The Heist, Gold Rush, Mission to Mars, Special Ops and Prison Break. The games are typically designed for 4-10 players and attract a broad and diverse consumer base of individuals, groups, families and corporate clientele. The company operates six unique games through nine locations in Nashville, Pigeon Forge, Orlando, Austin, Dallas, Houston, Chicago and Minneapolis, with several new locations planned for 2018.